Welcome one and all to this week's guide. As usual there's plenty going on but at the top end, very few of our local Premier League or Championship teams are playing at home because of the next round of the FA Cup. However, don't let that put you off as several of the ones that are in town are offering cheaper tickets than normal (Chelsea in particular) and there are a few other great deals around too. 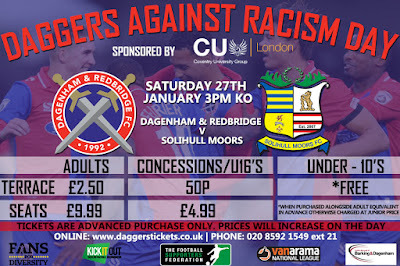 For me, the most eye-catching prices are to be found at Dagenham & Redbridge who are hosting their annual 'Daggers Against Racism Day'. 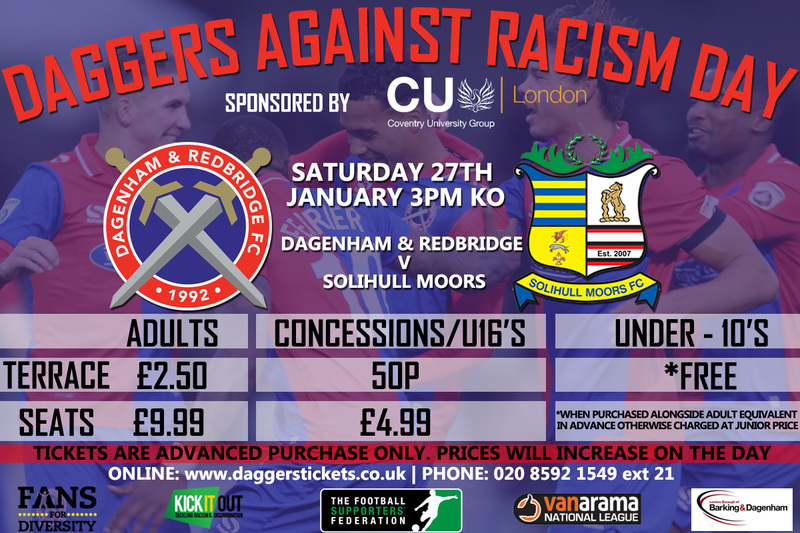 Tickets for the National League match against Solihull Moors are just £2.50 if you want to stand or £9.99 if you'd prefer a seat. They're even cheaper for concessions and kids - however, you must buy them in advance to get those prices. The club deserve a lot of credit for putting on this event in area which (in)famously elected 12 BNP councillors back in 2006 to make them the official opposition to the Labour Party. There was also some minor disorder at a previous anti-racism game back in 2012 but that, thankfully, that doesn't seem to have been repeated. Looking ahead a couple of months, if the England v Italy game at Wembley isn't for you then you might prefer another international friendly which was announced this week (thanks a lot to TLFG reader Colin W for the tip-off). Don't forget - prices increase on the day so BOOK NOW! It has been the custom for many years now for Australia to play mid-season friendlies in London as most of their players are based in Europe and there's a large community of supporters based in the capital. They started off using QPR's Loftus Road but now more frequently use Fulham's Craven Cottage which is where they'll be entertaining fellow World Cup qualifiers Colombia on 27 March at 8pm. Tickets go on sale for £25 on 29 January. I'm a bit of a sucker for games like this and last went to the Nigeria v Senegal game at Barnet's ground back in March. It's quite possible other friendlies could be announced in London before the World Cup so let me know if you hear of anything. Despite another hectic work schedule, I can actually say that I've got a game booked for this Saturday with my ticket already purchased for QPR's away game at Bristol City. The main reason I'm going is to visit family and friends but thought I might as well look in on this too while I'm down there. I've been to Ashton Gate quite a few times over the years but it's been a while and the ground has been developed a lot so it'll be interesting to see what it's like. Hopefully City will still be feeling the effects of their midweek EFL Cup semi-final against Manchester City otherwise we could be in for a hiding! There are over 80 matches in the London area over the next seven days. The highlights include an EFL Cup Semi-Final and the next round of the FA Cup. Bedfont Sports v Westfield @745pm - one of the games of the week at non-league level sees the top two in the CCL battle for supremacy. The visitors have been top for ages and seemed to be coasting to the title. However, with three of their last six games getting postponed, Bedfont have won eight of their last 10 to draw level. Although Westfield have far superior goal difference and four games in hand, it's made the title race interesting again and if the hosts win who knows what might happen?